A paper on the subject authored by Di Achille and CU-Boulder Assistant Professor Brian Hynek of the geological sciences department appeared in the June 13 issue of Nature Geoscience. Both Di Achille and Hynek are affiliated with CU-Boulder's Laboratory for Atmospheric and Space Physics. More than half of the 52 river delta deposits identified by the CU researchers in the new study -- each of which was fed by numerous river valleys -- likely marked the boundaries of the proposed ocean, since all were at about the same elevation. Twenty-nine of the 52 deltas were connected either to the ancient Mars ocean or to the groundwater table of the ocean and to several large, adjacent lakes, Di Achille said. The study is the first to integrate multiple data sets of deltas, valley networks and topography from a cadre of NASA and European Space Agency orbiting missions of Mars dating back to 2001, said Hynek. The study implies that ancient Mars probably had an Earth-like global hydrological cycle, including precipitation, runoff, cloud formation, and ice and groundwater accumulation, Hynek said. Di Achille and Hynek used a geographic information system, or GIS, to map the Martian terrain and conclude the ocean likely would have covered about 36 percent of the planet and contained about 30 million cubic miles, or 124 million cubic kilometers, of water. The amount of water in the ancient ocean would have formed the equivalent of a 1,800-foot, or 550-meter-deep layer of water spread out over the entire planet. The volume of the ancient Mars ocean would have been about 10 times less than the current volume of Earth's oceans, Hynek said. Mars is slightly more than half the size of Earth. The average elevation of the deltas on the edges of the proposed ocean was remarkably consistent around the whole planet, said Di Achille. In addition, the large, ancient lakes upslope from the ancient Mars ocean likely formed inside impact craters and would have been filled by the transport of groundwater between the lakes and the ancient sea, according to the researchers. A second study headed by Hynek and involving CU-Boulder researcher Michael Beach of LASP and CU-Boulder doctoral student Monica Hoke being published in the Journal of Geophysical Research–Planets -- which is a publication of the American Geophysical Union -- detected roughly 40,000 river valleys on Mars. That is about four times the number of river valleys that have previously been identified by scientists, said Hynek. The river valleys were the source of the sediment that was carried downstream and dumped into the deltas adjacent to the proposed ocean, said Hynek. "The abundance of these river valleys required a significant amount of precipitation," he said. 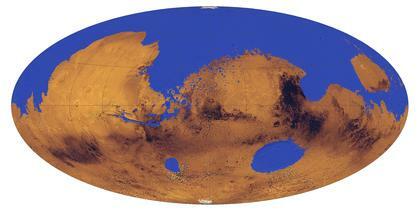 "This effectively puts a nail in the coffin regarding the presence of past rainfall on Mars." Hynek said an ocean was likely required for the sustained precipitation. "Collectively, these results support the existing theories regarding the extent and formation time of an ancient ocean on Mars and imply the surface conditions during the time probably allowed the occurrence of a global and active hydrosphere integrating valley networks, deltas and a vast ocean as major components of an Earth-like hydrologic cycle," Di Achille and Hynek wrote in Nature Geoscience. "One of the main questions we would like to answer is where all of the water on Mars went," said Di Achille. He said future Mars missions -- including NASA's $485 million Mars Atmosphere and Volatile Evolution mission, or MAVEN, which is being led by CU-Boulder and is slated to launch in 2013 -- should help to answer such questions and provide new insights into the history of Martian water. The river deltas on Mars are of high interest to planetary scientists because deltas on Earth rapidly bury organic carbon and other biomarkers of life and are a prime target for future exploration. Most astrobiologists believe any present indications of life on Mars will be discovered in the form of subterranean microorganisms. "On Earth, deltas and lakes are excellent collectors and preservers of signs of past life," said Di Achille. "If life ever arose on Mars, deltas may be the key to unlocking Mars' biological past." Hynek said long-lived oceans may have provided an environment for microbial life to take hold on Mars. The study was funded by NASA's Mars Data Analysis Program.